On A Budget but Need a Versatile Faucet? I Have the Answer! There are various parts of my website where I tell you what I do for a living, and I understand that not all of you really care about that. After all, you’re here because you want to find a faucet that ticks all the boxes in terms of your needs. However, I had to touch on the fact that I sell kitchens and everything that goes in them because this review is based on the experience I had with a pretty loyal customer of mine. He is in the business of property rental, and actually owns an apartment block. As you can imagine this involves a lot of hard work and one of the main issues he has is making sure the apartments not only meet the required standards, but that his tenants are happy with the appliances he provides. This is where I come to the Pfister FWK1680S faucet. 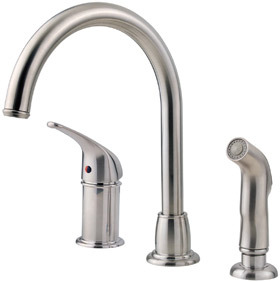 It’s a 1 handle, 3 hole high arc kitchen faucet that comes with a separate spray. The reason I’ve decided to add this model to my review site is more about the budget factor than all the “bells and whistles”. Although, as you will see below it does offer quite a bit for the money you pay. Available in either a stainless steel or a polished chrome color, the high arc faucet makes for easy reach and clearance which is perfect for filling pots and pans. Once installed, it sits with the handle to one side and the side spray to the other. What I like about the design is the fact that you don’t have lots of “nooks and crannies” to deal with when you’re cleaning. It has clean lines and isn’t fussy yet looks like it should cost more than it does. On the flipside, it can feel a little flimsy but that’s to be expected considering how much it costs compared to other models like this. 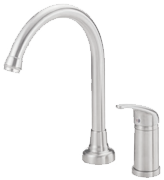 The main spout can be swiveled a full 360 degrees so flexibility while you’re at the sink isn’t an issue. You have one handle that deals with both flow and temperature. The features with the side spray surprised my customer because it has more than you think. There are three flow functions: stream, spray and pause. All of these functions can easily be selected from the palm of your hand by depressing the activation buttons. Leaking is one of the biggest issues with faucets and Pfister has thought about this. They have included their own Pforever seal which uses advanced ceramic disk technology. To back this up, the manufacturer offers a never leak guarantee. Pfister has also thought about ease of installation (something close to my customer’s heart). They have included something called the Pfast technology which means all the water supplies can be connected with a quick click. I happen to think this kitchen faucet is great for people who need to bulk buy and don’t want something expensive. It’s also great for those of you who don’t want any fuss, haven’t got much in the way of a budget but would like a few added extras. If you would like to know more, just take a look at Amazon. Every time I check this model there they always have some fantastic offers on price. By the way, my customer bought a number of these and so far he and his tenants are very happy!